Ayers Law Office is a law firm founded by Sylvania native Duff Ayers. The firm represents clients in a variety of practice areas, including Probate Administration, Wills, Trusts & Estates, Family Law, Real Estate Small Business Law, Misdemeanors and DUIs. Practical guidance. Tireless representation. Peace of mind. 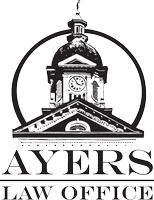 With years of experience, Ayers Law Office in Millen, Georgia can help you with your case. Copyright 2016 - Ayers Law Office, P.C.